Better Buy: Micron Technology, Inc. vs. Qualcomm, Inc. It's a tale of two seemingly similar companies with deep-rooted fundamental differences. Do you prefer the safe but unexciting bet, or are you swinging for the fences? Qualcomm (NASDAQ:QCOM) and Micron Technology (NASDAQ:MU) tend to appeal to similar sets of investors. Both microchip specialists tap directly into the mobile computing market, and their products are often found side by side in the same electronic gadgets. But those similarities are only skin deep. Dig a little bit deeper, and you'll find that the companies actually serve very distinct end-user markets, and the business models could hardly be more different. In the end, investors who like one of these stocks probably aren't interested in the other one at all. Micron works in one clearly defined sector. The company makes memory chips of various types, and its products can be found in everything from smartphones and tablets to PC systems and big-iron servers. Where there's computing power, you'll find memory chips. Micron is part of an exclusive group of elite suppliers, where only three companies can claim more than 15% of the global DRAM chip market. The company holds substantial pricing power thanks to this unbalanced market structure. Qualcomm runs a very different ship. The company focuses on high-speed wireless communications tools. 64% of last year's sales came from CDMA and LTE chip sales, and the rest from licensing agreements around Qualcomm's massive war chest of wireless technology patents. We're talking about a leader in its chosen field, as Qualcomm holds a dominant 65% global market share in LTE baseband products, but the company's own clients have started whipping up their own wireless solutions. By most metrics, Qualcomm will look like a superior investment to the casual observer. Qualcomm sports $6.4 billion if trailing free cash flows. Over the same period, Micron instead burned $2.4 billion of cash. 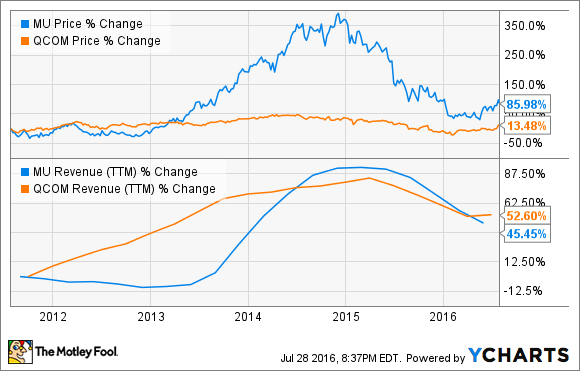 Micron's sales, margins, and income vary wildly over time. Qualcomm's are more stable and sane. Some of Micron's profit metrics occasionally dip into red ink, making it more difficult to run simple valuation tools on the stock. Qualcomm rarely follows suit. It adds up to a safer bet on a more predictable business. Heck, Qualcomm even pays a quarterly dividend, yielding 3.4% at today's prices. It's the risky technology stock for investors who normally don't touch risky technology stocks. That's all fine, but it's not my personal style of investing. I have a real-money stake in Micron, but none in Qualcomm, because the memory maker is drastically undervalued. Micron's chosen field of business happens to be extremely cyclical. As mentioned above, Samsung sometimes starts price wars over DRAM and NAND memory chips, feeding low-cost components into its own consumer electronics operations for a few quarters. When this happens, Micron stumbles. But Micron has a cushy cash balance to fall back on, and it's likely to pick up a few of its dying rivals on the cheap as they go bankrupt. So, you can pick up Micron shares when times are hard and the stock looks cheap, like now. Then Samsung lays off the memory-chip price wars again, the cycle turns, and Micron investors pocket some serious cash. When this exact scenario played out between 2012 and 2014, Micron's share prices increased more than sixfold in 24 months. And now we're back to a tough street price environment and low, low Micron share prices. The company is valued at just 1.2 times book value, meaning investors would barely break even if Micron stopped doing business and liquidated all of its assets today. Qualcomm's price-to-book ratio stands at 3.0, and that's still low in comparison to many other semiconductor giants. It's the same story if you look at enterprise value over EBITDA profits, price to sales, and other measures against fundamental financial health. Micron is priced for total disaster, but it actually remains poised to deliver the goods once this downturn passes. That's my investing thesis for Micron, and I expect to be handsomely rewarded in one to three years. On that time scale, the safer Qualcomm bet seems unlikely to beat my chosen champion.